Are you ready to Camp in Style? 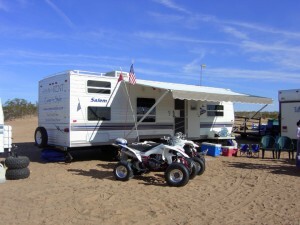 We Deliver RV Travel Trailers to Your Campsite! Out for a ride on the quad! 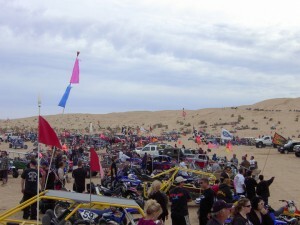 The Glamis Sand Dunes are the most popular off-road destination in Southern California. Hundreds of thousands of visitors arrive on various holiday weekends, often grouping in popular areas during specific times of the day, such as Oldsmobile Hill in the afternoon and Gecko Road in the afternoon. 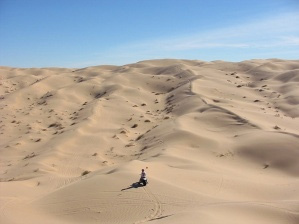 The BLM estimates that over 1.4 million visitors come to these sand dunes each year for day-use riding or to camp over weekends and ride in the dunes. The Glamis Sand Dunes are located southeast of the Salton Sea in the Imperial Sand Dunes Recreation Area southeast of the Salton Sea. The recreation area is 44 miles long by 6 miles wide which extends along a northwest by southeast line that follows the prevailing winds. The Dunes are a wildnerness area and with the exception of the All American canal which cuts through it, is devoid of structures. The lands are managed by the BLM and are the largest mass of sand dunes in California. Off Road Vehicles are permitted on some sections of the dunes, while other areas are closed. A camping permit is required and is provide d with your rental. Gordons Well is located in Imperial County, California 10.5 miles southwest of Ogilby, at an elevation of 154 feet. Famous for it's sand dunes, it is easily accessed just off Interstate 8. Take the Gordons Well exit off of I-8. Go north. At "T", turn right and drive over the canal. To reach the Butter Cup Sand Dune Campground take I-8 to the Grays Well exit. The Buttercup campground is south of the highway, to the left.